Bus: Bus 326, 327 and 328 stop at the Edgecliff Station. Bus 328 also stops at Darling Point Rd near New South Head Rd. Train: Edgecliff Train Station is right opposite. 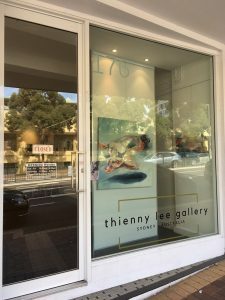 Free parking available at the Edgecliff Centre (where the Edgecliff Station is) right across the road from our gallery. • 1.5 hours free parking at the Aldi Carpark. Entry via the New McLean St. immediately upon turning in from the New South Head Rd. • 2 hours free parking at the East Point Food Fair (Coles) Carpark. Entry at the end of the New McLean St.
• 1-hour free parking available along the New McLean St.